Right now I am just using a Sony Cyber-Shot point and shoot camera. Although it is a great compact camera I don't think its doing the colors and fabrics of my outfits any justice (this skirt has beautiful gold threads in it) so I think I will have to break down and buy a SLR. Any suggestions? I was skimming through the June edition of Elle when I came across an article titled "CHANGING SHAPE" by Joe Zee. If you are a full-figured woman you have got to check out this article. When you 1st click the link it will open up to the article. To view the fabulous plus size designs modeled by the beautiful Tara Lynn you have to click SEE THE SLIDE SHOW. I believe there are 8 slides. My faves are by Jedda-Kahn, Kara Janx, Dana Maxx and Leila Shams (her skirt is AMAZING)!! The link is here. omg! you literally look like you just stepped out of a victorian painting...although i doubt they had such fabulous heels then. lol. i can't believe i'm first at your blog for a change. off to read the article now...i need a camera real bad too, mine broke at my friend's wedding. You seriously look so amazing!!!! You always do =) I'm oh so smitten with all of the textures and the wonderful soft colors of your outfit And your skirt is even more amazing with those gold threads. I can totally relate with needing a new camera mine is so old...LOVE your shoes!!! I forgot to mention on your last post that I had a total, "those are the most awesome accessories ever!!!! ", moment! This is So Victorian! I love it. The skirt is just dazzling! You my dear radiate! Hmmm....SLR's? I own a Nikon D3000 so, I'm all about the Nikons! Their so easy to use especially for a beginner camera but some people like Canons too! Go to a store and get a feel for the cameras see which fits your hands better, price range, etc! 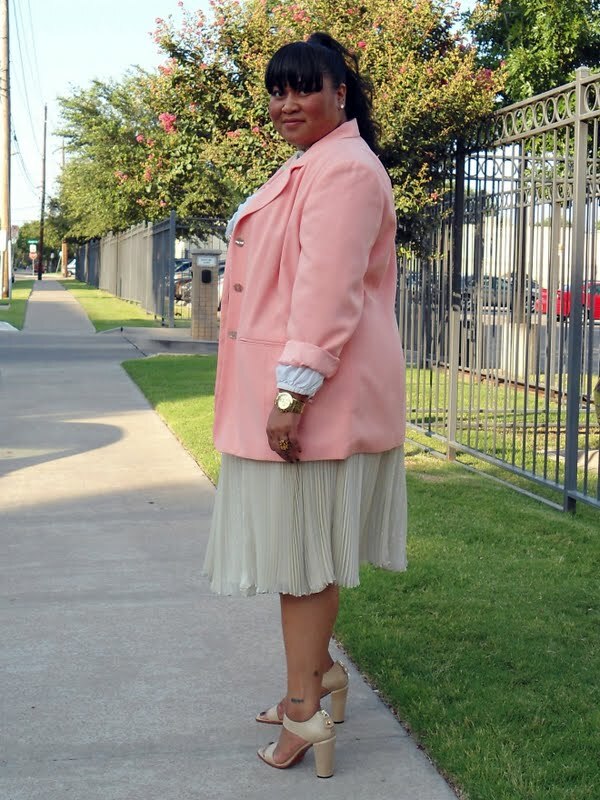 I loveeee that beautiful blazer Ms. Kiah, you look totally beautiful as usual! I love this on you. The skirt is just too too cute. I love ANYTHING with pleats. I noticed that you get alot of your blazers from Dillards??? Am I slipping? I've never bought a blazer from there. I am also in search of a camera. So I'm curious to see what everyone says. You look so cute Kiah, as always I love this soft color palette. I am in love with pleated skirts! I will look for the June magazine. Going to the pool tomorrow and will need something to read. This is so cute, this is so cute, this is so cute, this is SO CUTE! I love the delicate hues of this outfit. I'm also loving the bangs, very nice! I'm going to go look at the slideshow now! OH WOW! Texture and Colors of this outfit is amazing. p.s. thank you for the comment. Oh, Kiah, you know how much I love me a pleated skirt. And this one? This one is perfection. I love you in bright colors, but this soft palette is just gorgeous on you. 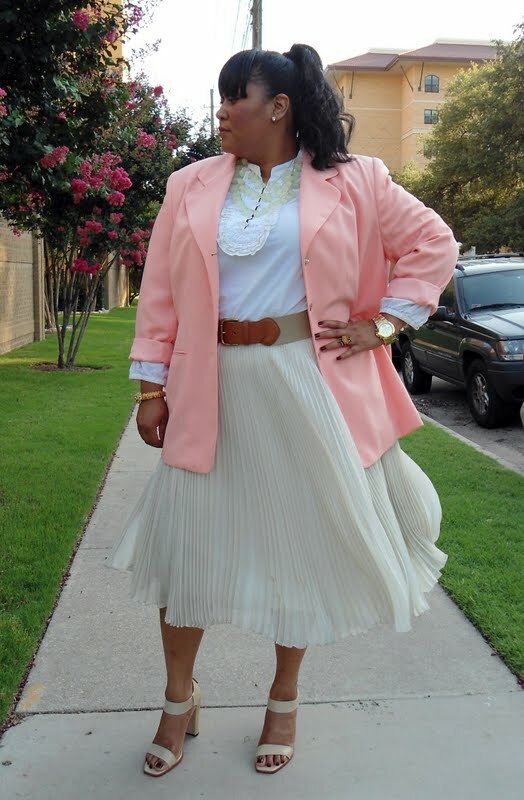 Pleated skirts are now supertrendy, and a great idea that you combined it with pink. Romantic look!. You look stunning!! I'm in love with your beautiful skirt!! so feminine and chic. Beautiful as always! By the way I knoe you dont do the whole tag thing but I gave you an award at my blog for being so FAB!!! Come check it out at my blog! I find your outfit so inspiring. I love the floaty skirt in the wind. I am in search of a better camera myself. love the skirt and the heels! i love the soft colors and romantic style of this outfit! These colors look so good on you! Very good combining going on there! WOW,I am totally in love with this outfit!! !So classy,feminine and chic!! !You look adorable! That silk skirt is just fab. I love the neutral tones of this, so soft and pretty! oh i love this outfit so gorgeous the colors look amazing together the skirt is so pretty and love it with that adorable blazer! thanks for the lovely comment! The colors in this outfit are so soft. I will check out that article in Elle. Do you know plus size is considered to start at a size 6 these days. Kiah, peach is a gorgeous color on you. and that skirt is really quite lovely! i love how you've worn it! I can definitely NOT do pleats. hahaha. I am fainting...FAINTING...over your skirt. It's so lovely. 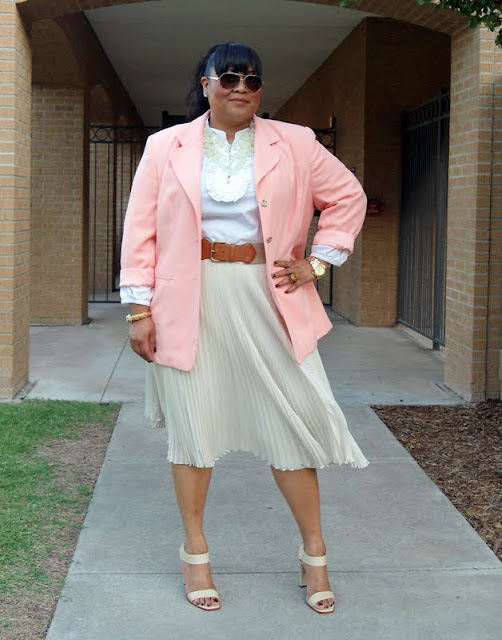 I'm loving the pastels in this outfit. Skirt and blazer are to die for! I'm a fan of your style, that we know. About the camera, have you tried asking on a blogger platform. You get great advice and maybe even buying tips. I upgraded to an in-between version, I'm still not ready for the big works yet. I love how trendy and classic all your outfits are. Follow my blog....please....i want to be your friend!